At Songbird Avenue, they are committed to giving. Every month, they work with top digital designers to provide the absolute best in digital scrapbook design. Don’t miss out on the most exclusive and high quality kits on the internet. For June's kit, Songbirh Avenue is so excited to have Vicki Stegall as it's guest designer. Vicki's flair for the unique and beautiful shine through in this one-of-a-kind kit! 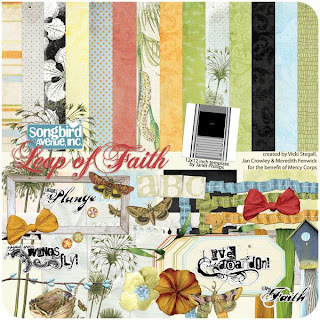 Songbird Avenue is proud to present "Leap of Faith". 100% of this month's profits will benefit MercyCorps. "Mercy Corps exists to alleviate suffering, poverty and oppression by helping people build secure, productive and just communities. Mercy Corps works amid disasters, conflicts, chronic poverty and instability to unleash the potential of people who can win against nearly impossible odds. Since 1979, Mercy Corps has provided $1.5 billion in assistance to people in 106 nations. Supported by headquarters offices in North America and Europe, the agency's unified global programs employ 3,500 staff worldwide and reach nearly 16.4 million people in more than 35 countries. Our strategy is to work in countries in transition, where communities are recovering from disaster, conflict or economic collapse. Our experience demonstrates that turmoil and tragedy often create opportunities for lasting, positive change. We add our greatest value on the ground by supporting those pockets of positive change with community-led and market-driven action." Included in this kit are: 14 patterned papers, 4 coordinating solid papers, 3 pebble brads, 4 folded ribbon frames, 4 journaling labels, 3 moth stickers (with and without shadows), 1 birdhouse, 6 coordinating crepe paper bows, 4 crepe flowers, 1 shabby chic frame, 1 bead branch (shadow separate), 1 leaf element (shadow separate), 1 nest (shoadow separate), 2 floral note papers, 1 x 12 inch paper tear, 1 dandelion sticker, 1 shabby chic tray, 4 word art brushes, (png & abr), 4 word art stickers (live with wild abandon, leap of fatih, spread your wings and fly, take the plunge), 5 coordinating crepe paper wraps, 1 a-z stamp alpha (mixed upper and lower case), 0-9, and 1 12x12 inch template by Janet Phillips. This kit is approximately 125 MB and is two individual downloads.